Palm/Pilot Was Here is the long-time home of the legendary adventures of Palm pilots! Early model Palm/Pilot units could drain their batteries dead if left in the cradle. Check to see if your unit is affected, and if so try our fast and simple fix. Sign up for our newsletter to be notified of new releases, usage tips, specials and updates! Power today's cutting edge GPS unit right from your Treo! CS SDrv is a power management application for the Palm SD slot, specifically designed to power the Spectec SPG-812 ultra-small SD slot GPS. 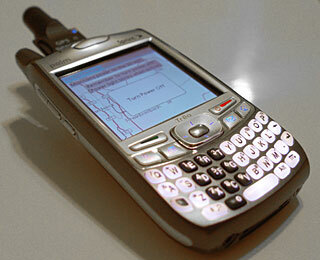 There are no batteries, no cables - the entire GPS plugs directly into your Treo or Palm's SD slot! Based on the ultra-low power SiRF III GPS chipset, this is the most amazing Palm GPS ever. Or it would be, if it worked. Unfortunately PalmOS was incompatible with this unit - so we developed CS SDrv! CS SDrv isn't Spectec-specific, so it could be used to power other SD-slot powered devices as well. CS SDrv couldn't be easier to use! Simply tap "Turn Power On", and SDrv starts delivering power to the SD slot. At this point you can switch away to your favorite GPS-enabled software. CS SDrv is unobtrusive, so you can run a wide variety of software, including email and Google Maps running over the air while you're using the GPS. Of course there are thousands of PalmOS apps, so it's impossible to be certain that it will work with every application on every device. That's why we make CS SDrv available as a free trial. Download CS SDrv and try it yourself, for free! Currently, an SD card must be plugged in the Spectec GPS to enable the power management. Palm's don't multitask well, so if you use an app that takes over the device, the slot may momentarily lose power. Tungsten C's can't use a Spectec SPG-812, because the SD slot is too deep and so the card won't plug in. Simply tap the "Turn Power On" button to power the SD slot, then go and use your other apps. When you are done, go into CS SDrv and tap the "Turn Power Off" button. CS SDrv comes as a free demo that is active for 30 days, until you purchase a registration code. In Demo mode, power is maintained long enough to let the GPS get a lock, try other software, and make sure that it works for you. When the time is up, you'll get the demo mode notice and power will be turned off, but you can turn the power back on to do more tests. The registered copy has no time limit. For Spectec SPG-812 functionality, a micro-SD card needs to be inserted into the GPS's slot, and the Palm device needs to have Bluetooth.